Poll: What feature do you want added next? What feature do you want added next? If you speak German, perhaps you'll enjoy this mod review: I don't really know though, since I don't. Hopefully he's saying nice things. New Feature - Spellchecking: Implementation of Jazzy library (jazzy.sourceforge.net) for spellchecking contents of the chat-input box periodically while typing. Misspelled words will have a dashed red line below them, and a simple english-language dictionary file is included in the mod distribution. For more advanced or alternate-language dictionaries, download dictionary zip files from here, extract the ".dic" file, rename it to match the Minecraft locale (e.g. en_US.dic), and place it in "config/tabbychat" in your minecraft directory. Additionally, you can create a file there called "user.dic" containing any other words (one per line) that you'd like to be ignored for spellchecking purposes. New Feature - Chat Opacity: a new checkbox in the advanced settings tab will now allow the chatbox text to be rendered fully opaque regardless of the chat opacity setting, which would still apply to the background of the chatbox. Bugfix: keybinds involving the Shift key will now work for the right-shift button. Bugfix: fixed issue with "message too long" kicks from server when the player attempts to send a 99-character-long chat message. Bugfix: Tabs marked as unread even if the message was seen in the current active tab, when that tab is not the master tab. Functionality change: In prior releases, the "Auto-channel searching" setting only affected the creation of new tabs - TabbyChat would still scan each message for channels, even with this disabled, and send messages to currently-existing tabs. Now, with this setting disabled, no channel searching will be performed whatsoever. If this affects you, I suggest migrating to custom filters for this purpose. Functionality change: To facilitate the previous bugfix, timestamps are no longer concatenated with the chat message directly, and are now instead a separate property of the chat message. The timestamp will now be set for every message according to the timestamp style setting, and will be either displayed or not according to the "Timestamp chat" setting. New feature: Dynamic Tab Names for Custom Filters. More details in this post. New feature: Pin chat interface open - keeps the chat interface from closing after sending a message by hitting "enter". The 'pin' button is just to the left of the resize handle on the chatbox (upper-right corner typically). Bugfix: Unable to use AltGr (sometimes called the "Compose" key) key combos the conflict with TabbyChat key binds to enter special characters in the chat box. 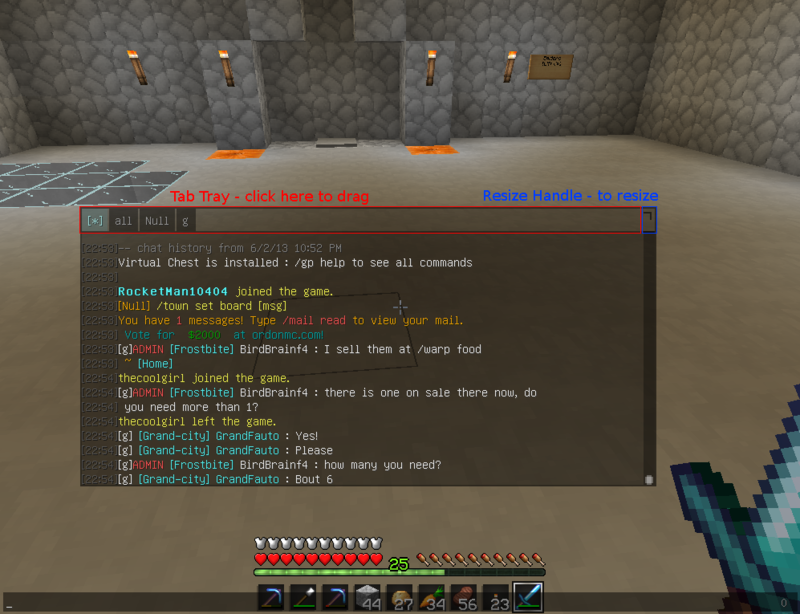 Better language handling: TabbyChat no longer needs Minecraft to be restarted to catch a language change. Bugfix: Improvements to filter storage and handling, should eliminate periodic issues where TabbyChat would mis-calculate the number of defined filters and throw a NPE in the 'applyFilterToDirtyChat' method. Improvement to multi-line chat sends, any additional sends beyond the first will be checked to see if they accidentally begin with a "/", and if so, will be prefixed with an underscore. This does not apply to situations where a command prefix found in the tab definitions or first send are carried through to the following sends. The currently-available language translations (Russian, German, Spanish, and Estonian) are now included in the compiled mod, and do not need to be downloaded separately. However, any language files in ".minecraft/config/tabbychat/lang" will take precedence over the built-in translations. Bugfix: Added button to chat interface to "leave bed" when in bed. Key binding change: switching active tabs can now be done with "Ctrl+Tab" (next tab), "Ctrl+Shift+Tab" (previous tab), and "Ctrl+Number" (where number is 1-9 - activates the specific tab numbered by display order). Previous key binds using Alt have been removed. Additionally, "Ctrl+O" in the chat interface will open TabbyChat's settings interface. Bugfix: corrected issue where chat input box wasn't pre-populated with text in all cases it should be. This should improve compatibility with other mods in general, particularly the Macro/Keybind mod. Bugfix: Chat channel/PM searching should now handle non-US characters appropriately. Single Player functionality: TabbyChat will no longer disable itself on single player worlds (although you may still disable it yourself). Typical 'server specific' settings will be stored in a folder called 'singleplayer'. Bugfix: Fixed order of settings screens, missing text on filter screen for "Hide chat" and "Expression"
Improved command prefixes and multi-line chats: under conditions where a tab's command prefix was added to the beginning of a message (i.e. a command prefix has been set for a tab, and that tab is the only active tab), that command prefix will be prepended to each line of a multi-line chat. Under other conditions, previous rules apply (i.e. if the chat begins with /, that will be prepended to each transmission, unless it begins with /msg, in which case /msg will be prepended. Timestamps will now ALWAYS be added to the chat log. As such, the timestamp style setting is always enabled, regardless of whether or not timestamps are displayed in the chatbox, as this setting defines the style used in the chatlogs as well. Added key bindings to tab switching: hold Left-Alt and hit the Left/Right keys to switch the active tab left/right, or hold Left-Alt and hit a number to go to that tab by display order. This only occurs if a single tab is currently active. Additional language support - to enable support for other languages, the appropriate language file should be downloaded and placed in ".minecraft/config/tabbychat/lang". This folder may need to be created. No language files have been completed yet, but German, Chinese, and Italian are in the works. Bugfix: Fixed issue where using Tab-autocomplete on playernames would freeze the client if more than one match were found. Bugfix: PM message patterns requiring the username will be skipped if the username is not set for this server (for some reason). Bugfix: Semaphore gates added to chat list modifications to prevent thrown exceptions for list index out-of-bounds and concurrent modification. Bugfix: Fixed issue where matching PMs clears PM tab contents if it already exists. Tab/Channel data for each server is now saved to disk and loaded on client startup. This contains current tabs, tab settings, activation/unread status, and the chat contents of each tab, which are displayed in gray with a note relaying the time of last save. Support for additional private message formats: Private messages displayed in the following formats will be caught by TabbyChat, placed in their own (new) tab, and have their chat command prefix defined as "/msg "
Send: "[PlayerMe->OtherPlayer]" -- Receive: "[OtherPlayer->PlayerMe]"
Send: "You whispered to OtherPlayer" -- Receive: "OtherPlayer whispered to you"
Send: "To OtherPlayer" -- Receive: "From OtherPlayer"
Changed auto-search functionality to ignore color/format codes if delimiter color/formatting is not specified in Server Config. Added two more delimiter patterns: "<(Combo)Pl.>" and "<[Combo]Pl.>". As described there, "combo" would be the name of the chat channel found, and "Pl." represents the player's name who sent the message (auto-searching will find the channel name and ignore the player name). Fixed Unread Notifications - they totally weren't appearing at all. This has likely been the case for all 1.6 versions. When looking for PMs/sends/tells to make new tabs for, TabbyChat will assume they're delimited using Brackets instead of whatever the current server's delimiter setting is. Fixed bug with 'exclusion' filters not applying to all tabs correctly. Chatbox will no longer automatically scroll to the bottom when new chat is received. If chat logging is enabled, a 'header' line will be logged upon sign-on to a server, in the form of "BEGIN CHAT LOGGING FOR () -- "
Fixed issue where chat input field would grow continuously in height while the client window is being resized. Multi-line chats are now sent from a single-threaded, synchronous process with a configurable time-delay between sends. In prior versions, creating two filters that both sent chat to tabs with the same name would result in two tabs with the same name, one for each filter. Now, only one tab of that name will be created, and both filters will send their matches to that tab. This also applies to pre-existing tabs from other chat channels. Settings are stored in four separate, human-readable files - two for global settings in config/TabbyChat, and two for server settings in config/TabbyChat/. If the new settings files are not found upon loading, TabbyChat will attempt to find and import settings from the previous settings format/location. For servers with a specified port, the settings folder will be named "()". Colon characters will be removed as they may cause issues with some Windows filesystems. When enabled, consecutively-repeated chat messages in a tab will not show multiple times, but instead will append a counter to the end of the original message, e.g. "[10x]"
TabbyChat should play well with the new chatbox settings in 1.5 for chatbox width, focused/unfocused height, and scale. Chats will appear formatted to whatever the chatbox width is at the time the message is received, and past chats will not change with the setting - only newly-received chats. Furthermore, as new tab buttons are created, they will fill the same available width as before, regardless of chatbox width setting. Now, the Up/Down keys will still move the cursor up or down a line when a multiple-line chat is present in the input field. However, when the cursor is already at the top or bottom line in the input field, continuing to press the up or down key will go backward or forward through the sent history (respectively). You can also hold the Ctrl key while pressing up and down to bypass the cursor movement on multiline inputs and directly scroll through sent history. Now you can type out more than one 'message' at a time. Chat Logs have been moved to a folder within your '.minecraft' folder called "TabbyChatLogs"
Fixed some massive timestamp-related bugs. ​Use Left Control-Clicking to select additional chat tabs and view multiple chat channels at the same time. Alternatively, you can use this method to Un-select all chat tabs, effectively turning chat off. 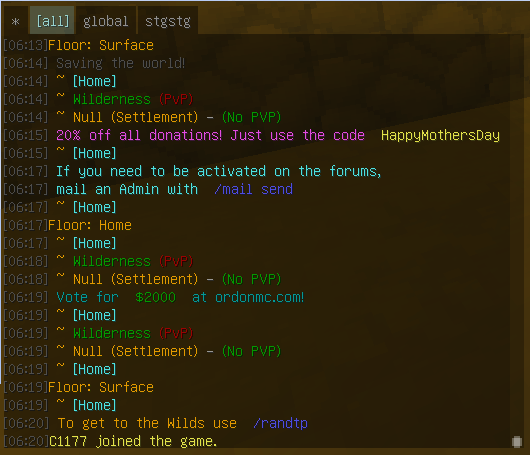 Normal tab background colors now match the chat window background, and both tab backgrounds and text now adhere to the user's "chat opacity" game setting. Additionally, where tab text was sometimes colored to reflect its state (blue for active, yellow for hovered, and red for unread), the tab background will now be colored appropriately as well. TabbyChat will now automatically check for existing updated versions. Language Files*TabbyChat will read the language option set for the Minecraft client and attempt to load the appropriate language file. TabbyChat will look for these files in ".minecraft/config/tabbychat/lang"
Create a copy of your ".minecraft/versions/1.6.1" folder inside the versions folder to represent your modded client if you have not already done so. Make sure to rename both the jar and json file, as well as the "id" line WITHIN the json file, to the same name as your new folder. Inside your ".minecraft/libraries" folder, create the following directory structure: "mods/TabbyChat/" and put the TabbyChat download inside that version folder - e.g. 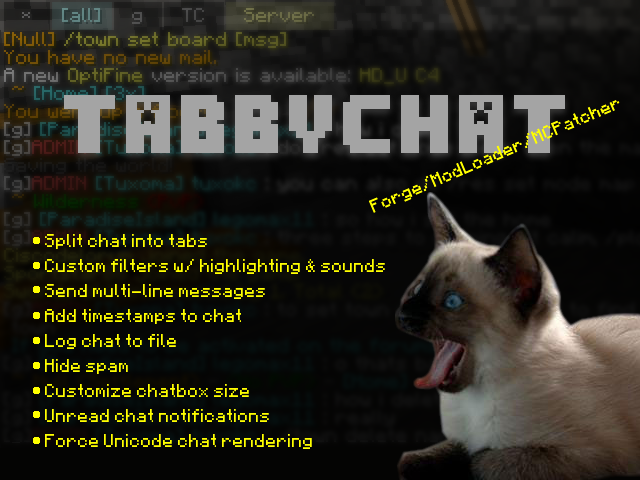 your TabbyChat download will now be in ".minecraft/libraries/mods/TabbyChat/1.8.07/TabbyChat-1.8.07.jar"
4. Setup a profile in your launcher to use your new version folder, and you're good to go. TabbyChat has been shown to be compatible with ModLoader and Forge (in general), Optifine, Rei's Minimap, Inventory Tweaks, Not Enough Items, Friends Overlay, and many more (pretty much anything not related to chat). Thanks to adf.ly revenue from the past 6 months as well as one generous donation, I've managed to purchase a VPS subscription, and have moved all files to that host. While I don't particularly need donations in order to continue development work on TabbyChat, they would be helpful in covering VPS fees.I hope you find TabbyChat useful and enjoyable, and would love to hear about it in this thread. However, if you'd like to show your appreciate through donation, I will accept donations in the form of Bitcoin to the following address:1FKEb858pTCWx2uVTLXTNXfqG3zc37XggPor alternatively, paypal donations to [email protected]If you choose to donate, you have my heartfelt thanks! At it's most basic, catching mentions of your player name is pretty simple - simply define a custom filter with your player name as its expression, and enable whatever type of highlighting and notification sound you may prefer. If you test this in practice, you may notice pretty quickly that it leaves a bit to be desired. Most noticeable is that you'll likely see highlighted matches and hear notification sounds every time you send a chat message. So, here I'll explain how to craft a better filter expression to avoid this. where X is the character or sub-expression that should NOT be present after prior expression. This is essentially three different expressions with logical OR statements between them - we're looking for "one" not followed by a t, or "onetwo" not followed by a t, or "onetwothree" not followed by a colon. The last expression is the most intuitive - we've already established that we want to ignore mentions of our name followed by a colon. The reason we need the first two is to cover other forms of our name, and the reason we need more look-behinds there is that, without them, the shorter mentions will still match "onetwothree:" whenever we chat. 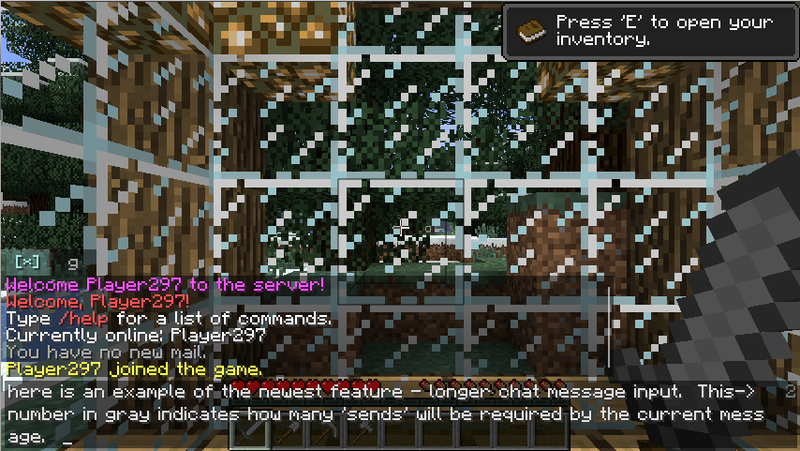 On your server, your chats end with ">"
So, there you have it. If this doesn't cover you, and you're not sure how to adapt it to fit your needs, feel free to ask in this thread. tab. The purpose of this tab is to serve as an un-touched reference of chat should be concerned that somehow, something (like a filter) is hiding/moving messages you don't want it to, and you want to be absolutely sure you're not missing anything. tab. However, filters that hide chat will still keep it hidden from this tab. I have some ideas for your mod. Able to send color, bold, italics, and underlined text. Would it be possible for this mod to add a scroll bar to the chat? Wow, this seems amazing. I can see it being really useful for servers with lots of chat channels. Downloaded. I had just thought about doing something kinda like that earlier today actually (the number of visible lines) - I should be able to pull that off, so I'll keep it in mind. Along with that, I might look into setting how many lines of chat you can see and/or how long they stick around when you DON'T have the chat input active. I'm not sure, I'm trying to limit myself to not editing any more base classes, but I should be able to pull off your suggestion within the classes I've currently modified. Another good idea - in fact, you're the second to suggest it, and I attempted to implement one after the first suggestion. There should be a scroll bar in TabbyChat already - the white vertical line near the right-hand border of the chat window. Take a look at the very first screenshot in the OP. I suppose it's not the most visually obvious scrollbar, but you can drag the bar up and down, click anywhere on it, etc. How about adding in Mod Update Manager so it can automatically search for updates? I am trying to create a channel that shows everything EXCEPT things that start with "NCP:"
I also tried using "NCP:", "^NCP", and "^NCP:"
With inverse turned off, it behaves as intended, with all text starting with NCP going to a new tab, however, with inverse turned on, it sends all chat, including 'NCP:' chat to my 'General' tab. One more request- a lot of messages are colored (for example, death messages on MineZ start with the player's name in yellow), would it be possible to make a way to say 'Anything with a yellow first word goes to this tab'? I apologize, there was in fact something wrong with inverse matching - blame my horrible testing procedures. A new version has been added to the OP, it should work as intended now. Thank you for catching and reporting that. 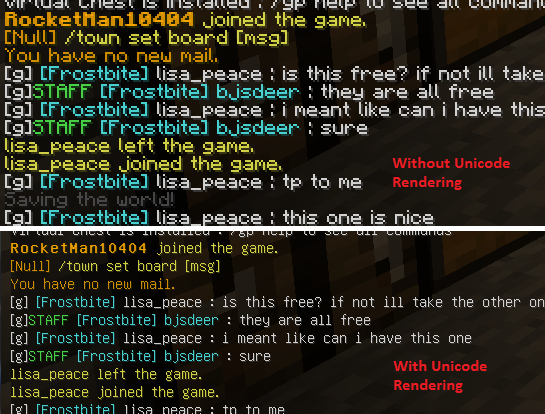 As for the colored messages, it should be possible, but it'll take a bit of rework - currently, filters are applied on un-colored messages, as I didn't want people to have to account for color/format codes all over the place in their expressions. I'll put it on the list though. I just posted another update fixing a fairly major issue I found recently that may have been affecting you. If you were able to get your filter-tab to work, but it didn't appear to be displaying new messages in real-time (only after switching tabs), try the new version for a fix. I have been searching for something similar to this for some time, maybe not with all the features you have included, I am surprised I found this mod and am surprised it hasn't gained popularity as fast as I would expect it, being rather unique in what it adds to the game. I am installing this as I type and am going to have lots of fun using it. Ha, I know, right? I've been searching so hard for some sort of chat-tab mod ever since I started playing on servers - I was so excited when I found Improved Chat (but never could find an updated version or get it to work). Honestly I don't find myself using a lot of TabbyChat's functionality, oddly enough, except for mostly chat highlighting and dings. Personally I'm too concerned about what might be unread in other tabs. The next feature I'm going to work on is checking for updates (which shouldn't be too hard), and then immediately after that, I need to find some way to get the client to indicate when there are non-visible chat messages received in other tabs when the chat window is not active. It does this now when the chat window IS active, but obviously I do spend a fair amount of play time not chatting. Hopefully I'll get something added soon. I was about to write my own until I found this. This makes playing on busy servers MUCH more enjoyable! If there's only one thing I would recommend, it's saving each tab in separate log files. This would make post game analysis much easier. Thanks for the feedback! Glad to hear it! I'll add your suggestion to my list (will update the roadmap soon). Issues I am having is that the [MayhemServers] announcements are showing in all chat channels, and it's showing when players go AFK in all channels, and I have set the filters to it shouldn't do either of those in the other channels. I have tried various filters, and I managed to get it working once but it would only work on one specific announcement. I have double checked spelling of everything and stuff, and it's all fine. I am thinking it is something in the RegEXP code I have put but I can't confirm it. Am I doing something wrong? I have a few ideas that will hopefully work (let me know if they don't so I can look into it further). Concerning your announcements, make sure there's no pipe-character before MayhemServers (I don't think there should be... correct me if you actually see those in-game). It could probably match on its own without a filter if you increase the settings for "Max length of channel name search" in the global settings - the default is 10, I believe, and that's 12 characters. Also, beware that filters operate on chat including color/formatting codes, so if the words you're trying to match with a filter are colored, you may need to adjust your expression to accommodate - I can help with that if this is the case. You know what, I was horribly mistaken - the custom filters deal with colored chat, but the mod actually pulls out all the color codes, stores their previous positions, and then attempts to match the regular expression. Afterwards, it applies any highlighting as necessary and re-inserts the color codes. So, the custom filters actually DO ignore the text color/formatting codes. My brain got sidetracked by all the code dealing with the removal/re-insertion. My apologies. Also, for clarification of the max length setting - it's an upper limit on the expected channel names when auto-searching for channels. So the channel search expression is built by the channel delimiters (looks like it's brackets in your case), and then some number of alphanumeric characters between 1 and this setting. For example, on the server I play on, TabbyChat automatically catches, creates tabs for, and re-directs chat starting with [g], [TC], [MOD], etc. - but not [Announcement] since "Announcement" is more characters than my max length setting. So these announcement messages will only show on the first tab (asterisk). I think the inverse filtering is still broken in the latest version, it's not working for me. Could you please double check you uploaded the right files? As best as I can tell, it's working for me in my testing. Just to be sure, the downloaded file for the version you're using is "[1.4.2]TabbyChat 1.1.0.zip", correct? Assuming it is, could you describe a bit more how you're applying the Inverse matching, and how what you're seeing is different from what you're expecting? It's quite possible there are some potential applications that haven't occurred to me to test, and therefore may not be working correctly. Yes I installed the 1.1.0 version. Non inverse filters work fine, and combining them with ORs works also, but there is some unformated text I still want to be able to see (shop prices), so I need a filter that keeps everything except certain tags. And it creates a tab with everything, including the shout messages. I'll look into that tonight then. I may not have tested it very well with auto-search off, so perhaps that added a wrinkle. It would be a huge help if you could provide a bit of a log, or perhaps a screenshot showing some of the chat you expected the filter to operate on. Thanks!